Birds are the natural reservoir for West Nile virus. If a mosquito bites an infected bird and the virus is transmitted to the mosquito, it may then become a host itself. If the same mosquito then bites a human, it can pass the disease to the human. Because of this cycle, noticing dead birds could be the first sign of West Nile Virus in an area. 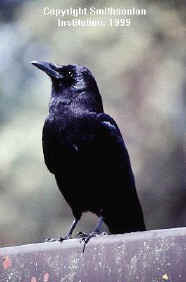 West Nile virus kills birds, and the most sensitive species in Ohio are American Crows and blue jays. They almost always die from infection with West Nile Virus. This is a new virus in the western hemisphere, but some studies have indicated that a dead crow rate of 1.5 per square mile per week is a prelude to human cases. Citizens should report dead crows and blue jays to their local health departments. Clusters of dead crows and blue jays may indicate increased risk of human disease. This is important to local health departments. Should they increase their prevention efforts or not? Citizens can help in this decision by reporting dead crows and blue jays to their local health department. 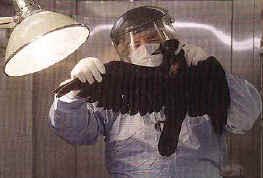 Depending on local resources, the local health department may send a person to inspect the dead bird, determine if it is a American Crow or blue jay, collect it, and send it in for West Nile virus testing. After two dead birds have been confirmed as infected with WNV in a calendar year, West Nile virus is considered to be present and active and there are infected mosquitoes present. No further birds need be sent for testing.